It is a major logistical operation to ensure troops and police units arrive in peace operations with their own equipment, ready to operate in challenging conditions. The memorandum of understanding (MOU) is an agreement between the United Nations and a Member State to establish the administrative, logistics and financial terms and conditions to govern the contribution of personnel, equipment, and services provided in support of a peace operation and to specify United Nations standards of conduct for personnel provided by the Government. In 1996, the General Assembly authorized procedures for determining reimbursements to Member States for their contributions to peace operations. As a result, an MOU between the UN and the troop or police contributing country is established for every formed military or police unit deployed to a peace oepration. The MOU details the major equipment, self-sustainment services, and personnel which the contributing country is asked to deploy, and for which it is entitled to be financially reimbursed. There are over 300 MOUs covering deployed formed units and represent approximately $3 billion in equipment, services and troop costs annually. This is out of a total budget for UN peace operations of approximately $7 billion. 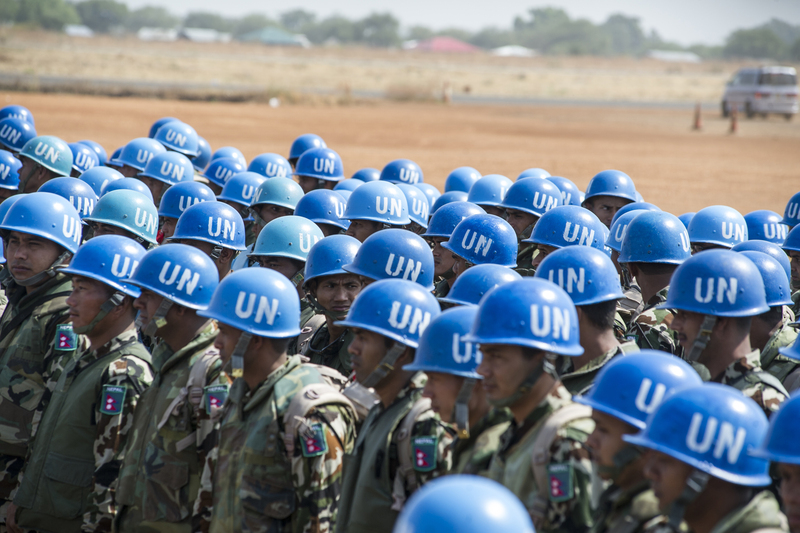 General Assembly resolutions 71/296, 67/261 and 68/281 effectively put in place a new framework for reimbursing troops and police contributed to the UN by Member States. In addition, General Assembly resolution 68/282, endorsing the recommendations of the 2014 Contingent Owned Equipment (COE) working group, also introduced new measures related to reimbursement, including rotation of certain categories of equipment at the UN’s expense. This framework highlights the importance of the reimbursement framework both for personnel and COE and its role in enhancing the effectiveness of United Nations peacekeeping and the peacekeeping partnership. The framework encompasses a number of interlinked measures which, for the first time, make an explicit link between contingent equipment and personnel including a measure whereby Member States with absent or non-functioning major equipment for two consecutive quarters are subject to a proportional deduction in their personnel payments. Over more than four decades the United Nations has encountered difficulty in putting in place a clear and predictable system to help determine and adjust the rates of reimbursement to cover additional costs incurred by contributing countries deploying to United Nations peace operations. A Senior Advisory Group (SAG) established by the Secretary-General, in 2011, to consider rates of reimbursement to troop-contributing countries and related issues, submitted its report to the Secretary-General (A/C.5/67/10), recommending a revised, more targeted and interactive approach that would link the process of collection of costs data, through a questionnaire, from a sample of “10 countries to be drawn from the top 20 T/PCCs, which should collectively account for a minimum of 50 per cent of total troops and police deployed over the three years prior to the survey. The sample 10 should include countries drawn from four income categories (high, high-medium, low-medium and low, based on World Bank data and classification), in proportion to the total number of troops and formed police units coming from countries in each of the income categories”. In its resolution 67/261, the General Assembly approved the new methodology to allow for a quadrennial consideration of the rates of reimbursement of contingent and formed police personnel. This methodology was applied in 2014. The results of the 2014 survey were published in the Secretary-General report A/68/813. The General Assembly, in resolution 68/281, subsequently approved a new reimbursement framework for contributing countries and a new single rate of reimbursement of $1,332 per person per month. This new rate came into effect on 1 July 2014 and continued until 30 June 2016. The rate increased to $1,365 per person per month from 1 July 2016, and will increase to $1,410 from 1 July 2017. A new survey will be undertaken in 2017/18, with results submitted for the consideration of the General Assembly during the second part of its resumed 72nd session. The Contingent Owned Equipment (COE) system was adopted by the United Nations to simplify the means by which countries are reimbursed for providing equipment, personnel and self-sustainment support services to formed military or police contingents in peace missions. The Memorandum of Understanding (MOU), the binding agreement between the UN and the Troop/Police Contributing Country (TCC/PCC) is the cornerstone of the COE system. The rates of reimbursement and the standards are reviewed every three years by a COE Working Group, an extension of the General Assembly. The last Working Group met in January 2017 and its recommendations were adopted by the General Assembly in its resolution 71/296. The resulting changes to the COE system are reflected in the 2017 COE Manual. The MOU is a negotiated, formal agreement between the UN and the troop/police contributing country that establishes the responsibility and standards for the provision of personnel, major equipment and self-sustainment support services for both the UN and the contributing country. It is signed by representatives from the UN’s Department of Operational Support (DOS) and the contributing countries Permanent Mission to the UN and remains in force until the end of the mandate of the peace operation, when the formed military/police unit repatriates from the mission, or until both parties mutually agree that the MOU requires adjustment and renegotiation. The MOU contains details of the personnel, major equipment and self-sustainment services that the contributing country will provide including the standard reimbursement rates that will apply. As these standard rates have been predetermined by Member States, contributing countries are reimbursed equally for providing the same generic types of personnel, equipment or self-sustainment services. Self-sustainment services are reimbursed by the UN on a per person/per month basis, payable from UN Headquarters directly to the contributing countries. Environmental – the terrain, climate, road conditions in the mission area. Operational Intensity – length of logistics chains, size of area of operations and infrastructure. Hostile Action/Forced Abandonment Factor – criminal activity, hostile environment, mines etc, and the potential for hostile engagement by unidentified factions or by individual or groups other than peace process participants. In addition, a Transportation Factor is applied to major equipment. Lease rates are increased by 0.25% for each complete 500 mile or 800 kilometer segment (after the first 500 miles or 800 kilometers) between the port of embarkation and the arrival point in the mission area. The same peacekeeping mission can be attributed more than one mission factor assessment. What is each party responsible for? Conduct Arrival Inspection of the contingent within one month of arrival and forwarding the Arrival Report to UNHQ; the report forms the initial basis of reimbursement to the Contributing Country (CC). Conduct Verification Inspections and forward reports to UNHQ, generally on a quarterly basis; the reports form the basis of on-ongoing reimbursements to CC. Conduct Operational Readiness Inspections once per mandate or at least each six months of service by the contingent in the mission area and forward reports to UNHQ. In addition to being used to calculate financial reimbursements, the Verification reports are used to review the levels and type of equipment and services required in the MOU. Conduct repatriation inspections and forward reports to UNHQ which establish the termination dates for reimbursement payments. Provide support to the contingent in accordance with the UN responsibilities under the terms of the MOU. Arrive with serviceable equipment that reflects the requirements of the MOU. Report and rectify deficiencies through national channels (at national expense). Assist mission staff in conducting inspections and raising Verification and other reports. Provide personnel, equipment and self-sustainment services in accordance with their responsibilities under the terms of the MOU. Receive, track and review verification reports. Report / clarify contingent deficiencies back to mission. 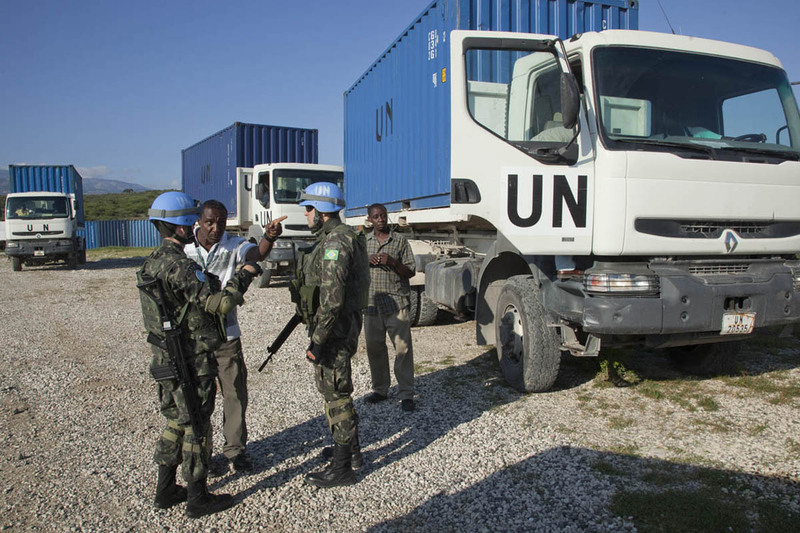 Report mission shortfalls to responsible UN operational and logistics parties. Determine levels of reimbursement - mission strength / shortfalls and recommendations. Disburse reimbursements to contributing countries. After the contingents have deployed, staff in the field commence Verification Inspections to ensure each party is meeting its obligations under the terms of the MOU. After each inspection, a Verification Report is raised. The report is reviewed and signed by the peacekeeping operation’s Force Commander/Police Commissioner, the Chief Administrative Officer and the Contingent Commander and is sent to UNHQ. At UNHQ, the report is reviewed against the MOU and the reimbursement is calculated and dispersed to the contributing country. 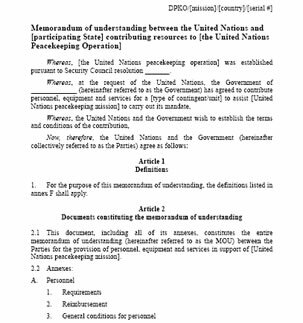 If the MOU has not been formally signed before deployment, as sometimes occurs, the UN reimburses the contributing country for the provision of personnel. Reimbursements for the provision of equipment and self-sustainment services are then back dated when the MOU is signed. Claims are calculated on quarterly basis and paid in March, June, September and December each year. How does equipment reach the mission? The United Nations is financially responsible for the costs of contingent deployment to the mission and arranges a commercial contract or Letter of Assist (LOA) with the contributing country to transport the equipment, either by Sea, Rail, Road, or in special circumstances by Air. LOA are like commercial contracts but are only arranged between the UN and contributing countries Governments. Troops are normally transported by air to the peacekeeping mission area, with a cargo limit of 45kg per person. Equipment is deployed for the duration of the service in the mission area by the contingent. Personnel rotations, whereby contingent members are replaced with new personnel occur on a periodic basis, usually every 6 to 12 months. When a contingent arrives in the field for the first time, it may need to be responsible for its initial provisions e.g. provide its own rations, water, fuel, and lubricants for the first 30 to 90 days. 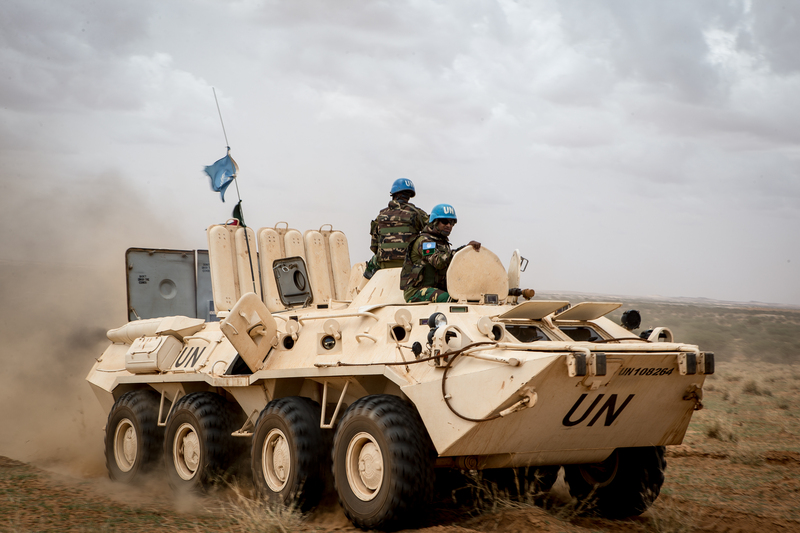 Following this initial period, the UN will normally provide rations, water, fuel and lubricants using commercial contracts, for the remainder of the contingent’s service in a mission. The same arrangements used in the deployment phase-- UN arrangements for moving troops and equipment to port, etc. -- are in effect for redeployment/repatriation. The COE staff conducts departure inspections, and the mission is responsible for base camp closure, rear party support, and provision of a departure security force if required. Most peacekeeping missions have established COE/MOU Management Review Boards (CMMRB) to oversee the implementation of the mission’s COE program, ensuring that the MOU remain aligned with the requirements of the mission. Reviewing compliance of the contingents and the mission with the terms of respective MOU. Reviewing adherence to the established COE verification and reporting procedures and Mission SOPs for COE. Identifying optimal utilization of military/police and civilian resources in support of the Mission and reviewing and recommending cost-effective support solutions. Reviewing the results of Operational Readiness Inspections, and analyzing shortfalls, surpluses and deficiencies and recommending remedial actions. Recommending amendments to MOUs resulting from changes in operational and logistic support requirements and contingent performance including reinforcements, repatriation of surplus equipment and transfer of responsibilities for self-sustainment support. Reviewing mission specific requirements, standards and scales of issue for facilities, equipment and supplies associated with self-sustainment categories such as Accommodation, Communications, Observation, Identification, and so on. Reviewing requirements and solutions for disposal of COE in the mission as an alternative to repatriation upon departure. DPO/DOS receives CMMRB reports and takes action based on the findings and recommendations, including contact and coordination with the permanent missions to resolve surpluses/deficiencies in major equipment or the provision of self-sustainment services and other logistic support or operational capabilities. Who carries out COE work? Mission COE staff have a variety of backgrounds, many involving national or international logistics support operations. Many have served in the military, with specialties in transport, information technology, and administration. Others have experience as inspectors in the private sector. The number of COE inspectors per mission varies depending on the size of the mission, the number of MOU to verify, and other factors. Typically, a mission will have a COE Unit consisting of inspectors, a database manger, and administrative support staff. COE Unit staff will be joined by technical experts (civilian/military/police personnel) on days of inspections.